“Lots of people talk to animals…not very many listen though…that’s the problem.” The Tao of Pooh. This week has been a mixture of pain and love for me. I realize it makes no difference how love comes into your heart as long as it comes. Love can enter through methods and ways inconceivable or perhaps what might seem a little silly to others, but nonetheless it enters in ways only known to God. Let me explain. No matter your preference of dogs, cats, gerbils, chickens, poetry, a moonlit summer night, grandma, church, your first love or your first child, I believe most people have a fair idea- whether you have been through painful pasts or just experiencing a great love for the first time-of the moment the frost or the glaciers melted from the heart. For me, it was Dimples (aka-Bunny-Girl). I have three cats and a dog, and they are my children. 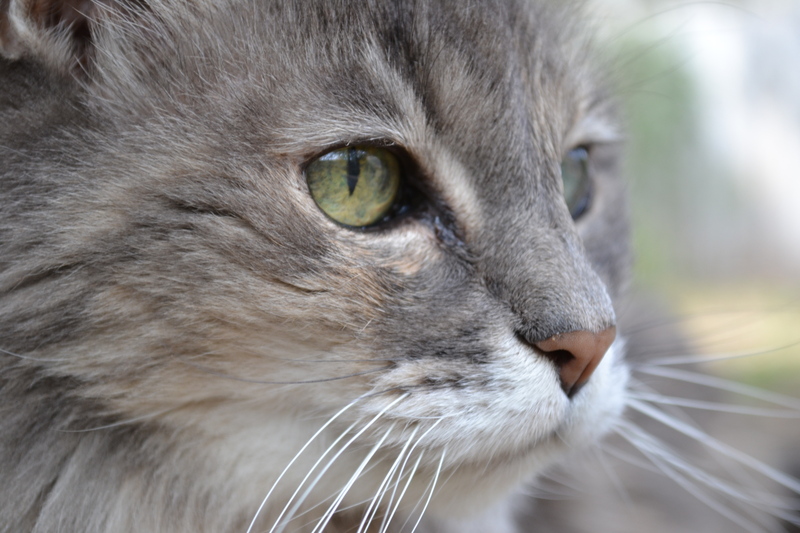 This week, one of them, Dimples, who is 18 years of age, has been diagnosed with renal failure. Tuesday morning we noticed her acting strangely and there were drops of urine around her. We rushed her to the vet, they ran tests, and she has been in the hospital for three days where she currently is at the moment. I knew I always had a special place in my heart for this precious little creature, but never realized the intensity until now and then it dawned on me, she renewed a love in me that had been lost long ago. My parents were divorced when I was 13 years old. I lost my friends, my home and all of our pets. A truly bitter seed began to grow. My heart became hard and with it the vow came never to be hurt again. Many tried to get through the cracks for several years, and while in most cases I smiled and was polite, they never made it to the “inner-room” except Dimples. I was in my late 20’s when a lady I knew asked me if I would foster a kitten they had found for a week. The mother had been killed and the kittens kept trying to hide into a crevice in a brick wall. As sad as the story was, I really did not want a cat. My husband’s cat that he had prior to our relationship was dying of cancer. So again, I really did not want another cat. I kept saying that all the way to the animal hospital where we were to pick up this kitten. I told myself it’s only for a week. We arrived 10 minutes late to the animal hospital and somewhat to my relief, they were closed. However, we drove a good distance, so I tried knocking on the door. The staff waved me away indicating they were closed. I knocked again, trying to explain we were here to pick up a kitten. Finally, a cleaning lady opened the door and handed me a big towel. I looked down into two tiny little blue eyes surrounding by a tiny gray face and mewing loudly. I was gone. My heart melted in that moment and for many moments to come thereafter. This was the passage into the forbidden areas of my heart; just enough for true love to gain a foothold in my life. Funny thing, you’d never think a little wonder less than a pound could do such a thing, unless you’re a mother of course. As I wait by the phone, I am armed with articles and information as to how we will help Dimples with her Chronic Kidney Disease. I feel this is the least I can do for all she has done for me. She is not my cat, or my pet, she is my friend. For all of you that know the blessing of such a friendship; I hope you enjoy this video. This entry was posted in Uncategorized and tagged authenticity, behavior, cat, chasing, chasing perfect moments, childhood, chronic kidney disease, cultural mindsets, freedom, friend, going home, healing, heart, ideaologies, illusions, journey, listening, love, memories, pet, reality, reconnecting with child, renal failure, safety, self, stories, the perfect moment, writing, writing resources. Bookmark the permalink. God loves animals. That was one of the reasons He saved Ninevah when Jonah prophesied to it. They were part of family. I lost my dog ​​7 months ago so can feel your lost. I have now decided to no longer have a pet I could not resist the sense of loss. Thank you Meiro. I am sorry for your loss. Simon, thank you for those very lovely and kind words. When we buried Sadie (our cat of 18 years who had died of kidney failure) I said, “She was not a pet, she was a member of our family.” We currently have Jake the Wonder Dog, Molly the Vampire Cat, OC the World’s Tiniest Cat, and preparing next Tuesday to inherit Snowball, who believes everyone in the entire world is her friend, and Lula, a Husky, who is about to go on a diet to reclaim her youthful figure. All of them are our children and as such, get loved on. Great post…and best wishes…keep us informed…Dimples and family are in our prayers. I am so sorry for your suffering. May you and your loved ones be surrounded with Divine Healing. I really have to get the book Tao of Pooh. It is just beautiful. Bless your hearts. Thank you that means a great deal. Thank you. Narhvalur where do I comment on your post? I have clicked on comments and can never get the box to come up.